Выражаю благодарность ВСЕМ Товарищам, помогавшим во время съемок и, которые бережно сохраняют память нашей страны. И лично Дмитрию Викторовичу Першееву и Василию Заболотному. Recently, it's a trend to rewrite history! Our common history. The history of the glorious victories and bitter defeats. And, you know, whatever the truth is, whole history without exception, belongs to us. And it has to be saved. It so happened that the human memory is short, and to fresh it up a bit I came to the one housing estate near Moscow. Frankly saying, I did a little bit at a perplexity. I.Z. -- Good day! ?? -- Hello. Vasiliy. -- I'm concerning the tank. Vasiliy -- Yes, it is waiting for you. I.Z. -- It's beautiful! Heavy breakthrough panzer IS-2, our Soviet response to German "Tigers" and "Panthers". Born in the middle of the war, in 1943, a little bit in a hurry, "Joseph Stalin the second" still strikes fear into the enemy. I.Z. - 122 mm cannon D-25T, was the most powerful weapon mounted on the tanks of that time, however, and the longest . The cannon was not balanced with the turret, making it difficult to turn with a roll of the tank. But the war dictated its own conditions. It was necessary to smack enemy's vehicles up on the maximum. 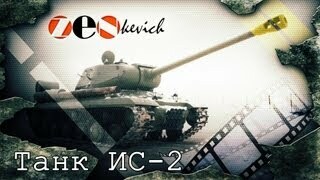 To fulfill such high-priority task at the Chelyabinsk Kirov Plant (ChKP) a tank with name IS-1 was taken and modernized. But! On the other hand in case of hit into hostile's tank, the panzer was uniquely destroyed. Hun's shells were not able to endure 25 kilograms slap of the Russian tank! I.Z. - Actually, this tank has the classical assembly for the Soviet tanks of that time, except for one thing... At the first time in domestic tank construction industry, mechanic-driver was sat in the middle... How can I climb up there???? Mechanic-driver also didn't have the hatch and had to climb up through the turret, in which sat three other crew members. This minus became fatal for many young guys. In case of fire the machine sometimes they didn't have a time to get out timely. But, to knock out such tank, it was necessary to do your best. The frontal armor reached 120 millimeters, and the side 90. As this tank was classified as severe, and it did had been severe, with the length of the cannon approximately 10 meters, width of three and a height of about three meters, he weighed 46 tons. V-twin, 4-stroke, 12-cylinder diesel V - 2IS this is unhurried force, but inevitable. Sure, the speed on the highway does not exceed 37 kilometers per hour, but why hurry? The radius of the target destruction is about three kilometers. In addition, the firepower is not funny, on the tank were also mounted 3 machine guns Degtyarev 7.62 mm and DSHKA 12.7 mm: two in front and one in back of the turret. In general, no matter how the critics say, the tank was very felicitous, power equal to European counterparts which were produced much later. And even after Great Patriotic War heavy breakthrough panzers IS-2 have honestly served to Poland, Czechoslovakia, China, Vietnam, Korea. And in Cuba, some say, they are still defending the embankments of Liberty Island. I.Z. -- Handsome... But agree, even the most perfect machine was constructed by ordinary people. Our ancestors. Who won the Great Patriotic War. Do not forget that. Well, but I will continue to hunt for the dinosaurs of the Soviet period. Тяжелый танк прорыва ИС-2, наш советский ответ немецким «Тиграм» и «Пантерам». Рожденный в середине войны, в 1943 году, немного в спешке «Иосиф Сталин второй» все равно наводил ужас на противника.